The APC Back-UPS ES offers affordable battery backup and surge protection for home computers. With enough power outlets to protect your entire system, built-in phone/fax/modem line (DSL compatible) protection and easy-to-install safe system shutdown software all make this power protection solution the best value for home and home office computers. The APC Backups RS high performance desktop battery backup features maximum protection in a versatile design. Up to five battery backup outlets with automatic voltage regulation (AVR) enable you to work through even the most frequent brownouts and power sags. 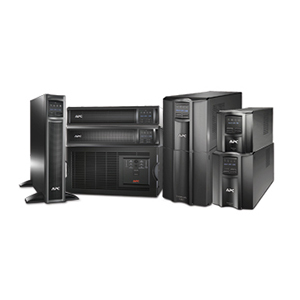 The Award winning APC Smart-UPS is the perfect UPS for protecting business critical fileservers (Intel or UNIX based), minicomputers, network switches and hubs, Point of Sale, retail/bank back office and ATM's. The award winning APC Smart-UPS is the perfect UPS for protecting business critical fileservers ,network switches and hubs, Point of Sale, retail/bank back office and ATM's. Rack Mount versions are the choice for rack optimized servers, server appliances, blade servers, other blade devices and rack-mounted network switches and hubs. Available in sizes from 750VA to 10000VA. APC Smart-UPS RT is a family of high-density, performance UPSs for voice and data networks, medical labs, and light industrial applications. Featuring double conversion on-line topology, the Smart-UPS RT protects your data by supplying reliable, network-grade power. Available from 1 to 10kVA. The APC Symmetra Power Array was designed to fit all these customer expectations. It is the world's first redundant, scalable, user-serviceable, and manageable power protection solution. Available from 4 kVA to 16 kVA.